he Pramac S12000-230v 63amp Elect/Start Portable Petrol Generator with long run fuel tank. 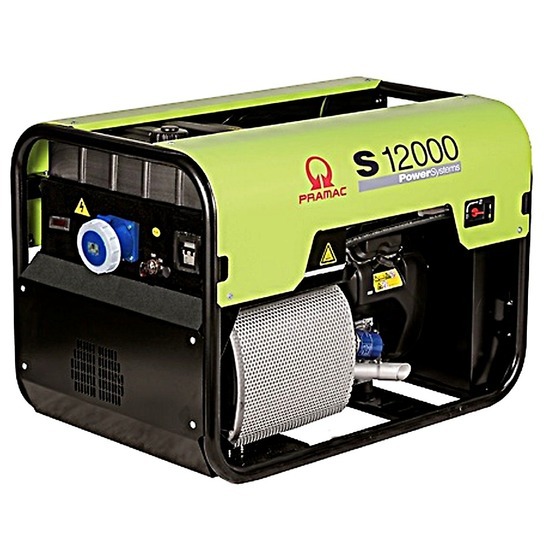 The Pramac S12000-230v 1-Phase petrol generator is the ultimate in quality. A fully featured professional generator, designed and manufactured to be the best portable generator available. A popular choice amongst those companies and individuals who want the BEST. The Pramac S12000 is built using a super reliable 4-stroke Honda GX630 engine. Pramac have designed this generator to ensure the highest performance and reliability levels at a very attractive price. The S12000-230v 1-phase is powerful, strong, robust generator yet very easy to maintain. 1 x 230V 230V 63 amp socket outlet +AVR +CONN.